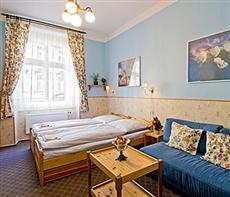 Boasting a charming central location, the Penzion Alice, Praha 8, Prague is a family-run guesthouse which remains popular with travellers from all over Europe. Where hotels may charge a fortune, visitors here are treated here to budget rates in a property which oozes character and comfort. Just a 10-minute stroll from the historical Old Town - Stare Mesto - this is the perfect choice of accommodation for those wanting to lose themselves in a city where 11th century architecture, bridges, cathedrals and church domes create an enchanting experience. If you are looking great value, then this guest house ticks all the boxes - and more! The building - originally a 19th century courtyard gallery house - has since been re-styled to encompass rooms, dormitories and apartments. Step inside and immediately benefit from the friendly atmosphere, welcoming staff and extensive amenities. An Internet point and wireless access, airport and railways transfers, city tours and car rental make your stay a thoroughly pleasant and stress-free experience. Vouchers can be purchased from reception for a scrumptious breakfast at nearby premises, where you can enjoy a great start to your day in the city.